Madi Frampton admits that during her first three years of track the 300 hurdles intimidated her. 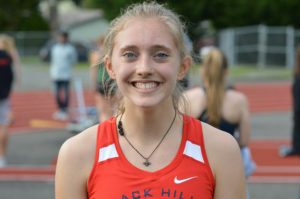 The Black Hills High School senior has definitely shooed away all the butterflies and eliminated any phobias during her final season as she heads into the Class 2A state track and field championships as one of the premier hurdlers in the state. 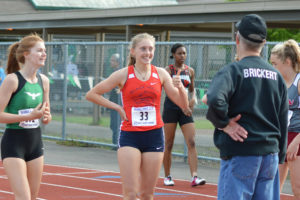 Frampton and other local athletes will compete in the 2A/3A/4A state championships at Mount Tahoma High School on May 24-26. Frampton will participate in four events, competing in the 100 and 300 hurdles, the long jump and triple jump. Frampton was a gymnast during her elementary and junior high school years before deciding to make the transition to track as a freshman. She was immediately drawn to the hurdles. The first time Frampton ran the 100 hurdles she crossed the wire in a shade under 22 seconds. 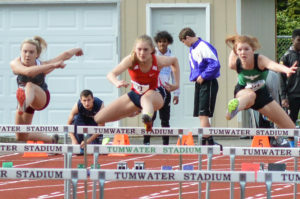 During that same meet she needed a tad over 56 seconds to complete the 300 hurdles. 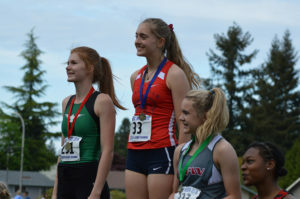 It’s worked as Frampton won the 2A District 4 championship in the 100 hurdles in a school record time of 15.01 seconds. It marks the second time this season she has posted that time in the event. The mark also represents the second fastest among 2A competitors in the state this season. Only Ellensburg’s Tia Hill has been faster this year in the 100 hurdles in the 2A ranks, coming into the state meet with a season-best time of 14.63. Frampton also finished third at districts in the 300 hurdles, stopping the clock in 47.80. Her best performance in the event came at the 54th annual Shaner Invite in early May when she broke the school record with a time of 46.19. Remarkably, it occurred in the one event Frampton was scared of the previous three years. Despite being reluctant, Frampton finished ninth at state last year in the 300 hurdles. Hurdles will not, however, be the only event at the state meet Frampton will compete in as she will also look to claim state titles in the long jump and triple jump. Frampton finished third at the district championship in the long jump with a distance of 16 feet, 7.25 inches and claimed the district title in the triple jump with 35-6.5. Both are personal records for her.